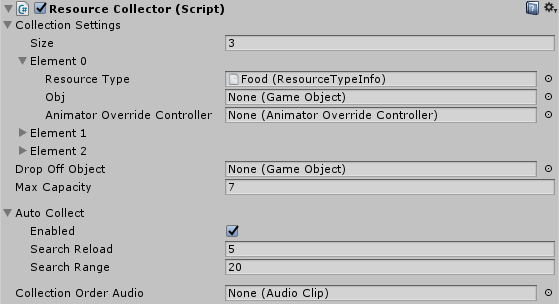 Add the Resource Collector component to the main unit’s object so that the unit can collect resources. Resource Type: The Resource Type Info asset for which the next two fields are defined. Object: The collection object (child object of the unit object) that is activated when the unit is actively collecting a resource of the above type. Animator Override Controller: This animator override controller will be activated when the unit is actively collecting a resource of the above type. Drop Off Object: Child object of the unit’s main object that is activated when the unit is dropping off resources. Only valid if auto collecting resources is disabled. Max Capacity: The maximum capacity that this unit is allowed to gather from each resource type before having to drop it off at a drop off location. Only valid if auto collecting resources is disabled. Auto Collect: When this option is enabled, the collector will be able to automatically search for resources to collect. The Search Reload field defines the time period at which the unit looks for resources to collect and the Search Range field is how far the unit searches for these resources.